New Delhi, Jul 03, 2011: Batting superstar Sachin Tendulkar, on the verge of an unprecedented 100th international century, returned on Saturday to a strong Indian squad for the upcoming Test series in England. 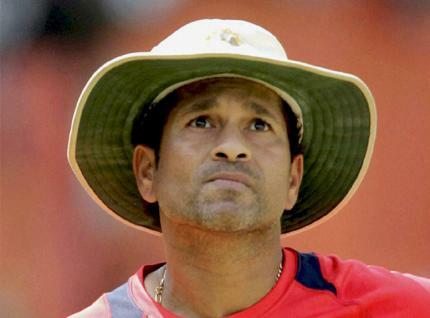 Tendulkar, with 51 hundreds in Tests and 48 in one-day internationals, had opted out of the ongoing Test series in the West Indies. He is also the world's leading scorer in both Tests (14,692) and one-dayers (18,111). Openers Gautam Gambhir and Virender Sehwag, pacemen Zaheer Khan and Shanthakumaran Sreesanth, and all-rounder Yuvraj Singh, who missed the West Indies tour, also returned to the squad after regaining fitness. "Sehwag will join the team a fortnight later," the Indian cricket board said in a statement, meaning the opener will miss the first Test. The four-Test series starts at Lord's on July 21, followed by a one-off Twenty20 match and five one-day internationals. The team for the limited-overs matches will be announced later. The full-strength squad will be led by wicketkeeper-batsman Mahendra Singh Dhoni, with Gambhir as his deputy. India named five fast bowlers as conditions are expected to favour them in England and two spinners in Harbhajan Singh and Amit Mishra. Praveen Kumar, Ishant Sharma and Munaf Patel are the other pacemen. Batsman Virat Kohli, part of the current squad in the West Indies, was dropped while Wriddhiman Saha was picked as a second wicket-keeper. India won their last Test series in England in 2007 under Rahul Dravid. Indian Test squad: Mahendra Singh Dhoni (capt), Gautam Gambhir (vice-capt), Abhinav Mukund, Rahul Dravid, Sachin Tendulkar, Venkatsai Laxman, Suresh Raina, Harbhajan Singh, Zaheer Khan, Shanthakumaran Sreesanth, Praveen Kumar, Ishant Sharma, Munaf Patel, Amit Mishra, Yuvraj Singh, Wriddhiman Saha, Virender Sehwag.